Biola Magazine recently sat down with Ashish Naidu, assistant professor of theology at Talbot School of Theology, to discuss the biblical case for hell and how Christians can respond to some of the current challenges to the doctrine. How central is the doctrine of hell for Christianity? Is it “essential” or “nonessential”? I would think it’s an essential doctrine. Look at what the Bible has to say about hell, and look at Jesus. Jesus was perhaps the most prolific teacher on the doctrine of hell. Historic Christian orthodoxy has always maintained the doctrine of hell. If you go back to the earliest creeds — the Apostle’s Creed, the Nicene Creed — they all talk about Christ returning to judge the living and the dead. If I remember correctly, the word “hell” occurs 12 times in the Gospels, 11 of which are from the lips of our Lord. So definitely, the doctrine of hell is central to the Christian faith, and always has been. What is the standard view of hell within orthodox Christianity? The orthodox position affirms an eternal, conscious torment for all those who reject Christ and reject the gospel message. That has been the wide swath of orthodoxy right from the get go. The historic Christian faith has always affirmed the eternality of life for those who believe in Christ and the eternality of death for those who disbelieve or reject him. There have been individuals within the broad evangelical community who have subscribed to this view of annihilationism, which basically is the idea that the unbeliever will be tormented for a particular amount of time in hell but will eventually be terminated or annihilated. It’s the idea that fire destroys and brings things to an end — to ashes. It’s the idea of conscious, but not eternal torment. I’m not quite sure if there’s any biblical basis for this. From what I’ve seen and what I’ve read, the problem seems to be more existential, more emotional than scriptural and textual. Annihiliationism is held by some theologians in the church — Clark Pinnock, Edward Fudge — but to be honest, textually speaking I’m not quite sure how they can affirm this. What is the biblical evidence for the eternality of hell? In Matthew 25:31-46, you’ll notice that Jesus uses the same adjective to talk about eternal life and eternal punishment. So if life in Christ is going to be eternal, then life without Christ is also going to be eternal. Look how Matthew 25:46 puts it: “And these will go away into eternal punishment, but the righteous into eternal life." The Bible is replete with mention of everlasting punishment for those who would reject Christ. In Mark 10:29-30, Jesus responds to Peter by saying: "Truly, I say to you, there is no one who has left house or brothers or sisters or mother or father or children or lands, for my sake and for the gospel, who will not receive a hundredfold now in this time, houses and brothers and sisters and mothers and children and lands, with persecutions, and in the age to come eternal life.” So when Jesus talks about eternal life he’s talking about everlasting life—something that will go on forever. I’ve noticed that, very famously, Rob Bell has argued that the word “eternal” does not necessarily mean eternal life. There’s plenty of evidence in scripture that argues to the contrary. That’s a very selective reading of scripture and selective way of exegeting scripture. Has evangelicalism emphasized hell too much? I think in a regular church we subscribe to an expository method of preaching, and so when the doctrine of hell comes up, you’re supposed to preach it. Preaching about hell can be a very loving thing to do, because love warns. Jesus warned about the impending judgment that is to come. When you and I speak or preach about hell, we don’t do it with dry eyes. We do it with urgency in our hearts, so that others would hear the good news of the gospel. You don’t have to go to hell. Love warns. Warning people of an impending act of judgment is a loving thing to do. But I do understand the other aspect of the question — that we have preachers who are constantly preaching hellfire and brimstone messages from the pulpit, with no emphasis on the idea of the love of God. So there are instances where that can be a problem. One of Bell’s claims in Love Wins is that after death, unbelievers will have another chance to accept Christ — that our life on earth isn’t the only chance to be saved. Are there any grounds for this belief in the Bible? Bell has selective exegesis here. He likes to use Colossians 1 and Ephesians 1—where God talks about reconciling all things. But if you look at the writings of Paul, both in Colossians and Ephesians, he also talks about the wrath of God coming upon the disobedient. Paul is very clear about his teaching on hell. When the Bible talks about reconciliation in those contexts it is talking about all of creation submitting itself to the lordship of Christ, the obedient for his blessing and the disobedient for his curse. He came as a savior. He came to offer salvation the first time around. When he returns he is going to come back as a king and judge. That is the context of Ephesians 1. It’s not that God is going to give second chances to people after they die. The Bible is very clear on this. The writer of Hebrews 9 says it is appointed once for man to die, and after that, judgment. In the chapter “Does God Get What God Wants,” Bell claims: “Reconciliation brings God glory; endless anguish doesn’t.” How does an eternal hell bring God glory? I think when we talk about the love of God, we also talk about God loving his character, his nature, his infinite perfections. And of course, his character is reflected in the law of God. The law reflects his infinite goodness, love and mercy. So when people break the law of God, they’re breaking the very moral code that God gave us, which is a reflection of his infinite goodness. Scripture very clearly says that when the law is broken, the penalty must be paid. The soul that sins must surely die. God is doing the most loving thing when he sent his son Jesus and offers us salvation. He’s saying, “Here’s my son: Receive him, so that you might have life and so that you may not enter hell.” Hell brings glory to God because it basically is a reflection of the fact that he takes sin seriously. He can’t overlook sin or brush it under the carpet. It brings glory to his name because God upholds the infinite justice of his character. And to do that is the most loving thing to do. Hell points to the fact that God means what he says and will do what he promised. In a recent Time cover story on hell, Jon Meachem wrote that “the dominant view of the righteous in heaven and the damned in hell owes more to the artistic legacy of the West, from Michelangelo to Dante to Blake, than it does to history or to unambiguous biblical teaching.” Is this true? How much of our concepts of heaven and hell are cultural rather than biblical? Long before Dante and Michelangelo depicted what they thought about hell, the Bible taught it, going back all the way to Genesis. Fire has long been associated with God’s judgment. We think of Sodom and Gomorrah, and how God reigned down sulfur and brimstone on the city for its wickedness. The idea of fire is always associated with the judgment of God in the Bible, and that’s how the Renaissance artists get the picture. It’s not something they’re making up out of thin air. Fire and judgment is a biblical picture. If we believe that hell is a place reserved for any non-Christian to eternally suffer, then we would have to say that both Gandhi, and Hitler, and the millions of Jews that Hitler murdered, are all in hell, right? There’s definitely an existential edge to that question. At the end of the day, we know that we’re dealing with a just God, a loving God, a God who is our heavenly Father. That’s why we don’t view his sovereignty as tyrannical. We also see clearly the way that people are saved. There is no other name under heaven given to men by which we must be saved (Acts 4:12). Jesus is the only way. There have been many people who have considered Christ a great moral teacher, but haven’t confessed him as Lord. And I think as believers we have to be faithful to Scriptures that say that anyone who has not confessed Jesus Christ as Lord and Savior will not get to spend eternity with him. Do you think it’s ever wise for Christians to make statements about who is or isn’t in hell? I think we should be very careful if we are going to speak in those terms, because at the end of the day, you and I do not have infinite knowledge. Could it be possible that some of the Jews in the Holocaust turned to Christ before they were executed? It could have happened. We just don’t know. What if I’m a good Muslim who, because I was born into an Islamic culture and context, simply followed that religion as earnestly and faithfully as possible, because it’s what my family taught and I didn’t know any different? God is sovereign. We know that the story of our salvation does not begin on this earth, but in eternity with Christ. God chose us in Christ before the foundation of the world. So God knows how to communicate the message of the gospel to people out there. Look at my own story. Born into a Hindu family. Several generations ago, my great-grandparents came from the Hindu priesthood, idolaters. Then in the late 1800s, British missionaries came to India and converted them. I see God’s sovereignty there. He sent the messengers with the gospel, and in the gospel proclamation my ancestors received the message and were converted. Likewise, I see and hear stories of individuals in the deepest and remotest Muslim nations where the gospel message is proclaimed and people receive it. One of the things we say in this is that the seeker finds out that he is sought. InThe Pursuit of God, A.W. Tozer really captures this. There is a longing for God that we all have. Before I became a believer, I thought I was the one seeking after God, only to realize after reading Scripture that it was God seeking me — the “Hound of Heaven.” At the same time, I do understand that not everyone hears the gospel. That’s why it’s our task as Christians to obey the Great Commission and to take the message of the gospel to the ends of the earth. It’s a serious calling. We cannot afford to neglect it. What happens to unsaved children when they die? Or an individual lacking the mental capacity to understand the gospel? There have been two views historically on this topic. One view basically says, only the children of the elect, of believers, will go to heaven, because of the covenantal structure they hold to. But I hold to the second view, which states that all children and infants who die are actually elect. All children will go to heaven. The Bible is very clear about the loving heart of God and Jesus’ relationship with children. Jesus himself takes a child and puts him in his lap and says “Forbid not the little children come to me, for such is the kingdom of heaven.” We can also look at David, who, after his little son died, said, “I will see him again.” I’m of the opinion that infants who die are elect and will have life eternal with God. Same thing for people who are mentally challenged — adults who are operating on a child’s mental level. In these cases I think there is good biblical support for the idea of the grace of God and the age of accountability. Though this phrase doesn’t occur, I think we can extrapolate this teaching from Scripture. Ashish Naidu is an assistant professor of theology at Biola’s Talbot School of Theology, specializing in historical and systematic theology. He holds a Ph.D. from the University of Aberdeen. Dennis- Yes, that would be fine, as long as you include a mention that the article was originally published in Biola Magazine. Thank you! My sincere appreciation to the Biola Student Chapel Association that sponsored the May 16 debate whether hell is a place of unending conscious torment (advocated by Talbot/Biola Professor John McKinley) or a place of total, irreversible annihilation (my position). No one who attended that debate, and no one who reads THE FIRE THAT CONSUMES (Wipf and Stock, 3rd edition, 442 pages, 2011, foreword by Richard Bauckham), could possibly say, as Professor Ashish Naidu does here, that he is "not quite sure if there’s any biblical basis" for annihilationism. Professor Naidu thus argues that hell is an "essential" doctrine, while pleading ignorance of the biblical texts that turned Clark Pinnock and Edward Fudge from traditionalism to annihilationalism, as well as Aberdeen's long-time professor I. Howard Marshall and many others who could also be named. Would you be willing to state in a few points, what you understand to be the biblical basis for your view that "hell" is the total, irreversible annihilation? You have to believe that if it takes 442 pages of your book to make your case, it will not be read by the masses, or even by a majority of serious Christian educators. You make that point in your comment above as not even Professor Naidu had read it, or perhaps had not even perused it. So, point us in a direction that you think will take the serious student/scholar to your conclusion on the doctrine of hell. I'm not arguing Dr. Fudge's position t; I just find it ironic that he posted his comment on the 170th anniversary of Jonathan Edwards' sermon, "Sinners in the Hands of an Angry God" at Enfield, Conn. He should just take up his argument with Jesus, Himself in Matthew 25:46. Sorry folks, that's 270th anniversary, not 170th. I find Prof. Naidu's response to the questioners inquiry, "How does an eternal hell bring God glory?" to be seriously lacking. His reasoning doesn't at all negate the Conditionalist view of hell, but can mostly be said regardless of whether one is in the Traditionalist or the Conditionalist camp. I said "mostly" because I find it striking that he thinks he can say that eternal hell (in the traditional view) upholds the infinite justice character of God and that God's giving His Son are both "the most loving thing" --- either one is the most loving or the other is, not both. Even Jesus didn't try that non-starter argument when asked which Law was the most important (i.e., to love the Lord your God is first and the second is like it, loving your neighbor as yourself --- but it's still second). While perhaps that's what Prof. Naidu was similarly intending to convey, it seems all too often Traditionalists refuse to scrutinize their own words, arguments and positions as carefully as they do non-traditionalists' claims. Thank you Dr. Fudge for taking the time to post on this thread! I found your book about 5 years ago and was overwhelmed with the humbly exhaustive biblical treatment of every potential passage that deals with the concept of eternal punishment. I to was extremely frustrated with Professor Naidu's uninformed quote "I’m not quite sure if there’s any biblical basis for this." To me this is just another example of Christendom's knee-jerk habit of destroying a thought before it is even studied or understood. Unfortunately, this problem has plagued the entire history of our faith (I think Martin Luther was affected by it just a little). It is quite obvious that Prof. Naidu has no idea what the basis for irreversible annihilation is, but to say that there is no biblical basis for this is just plain wrong. I'm not saying you have to agree with it, but to say it doesn't exist and then mention the author of an exhaustive biblical work on the subject in the same paragraph...I was really at a loss for words. Mr. McLaughlin poses yet another problem with our church. Unfortunately, it does take time, study and effort to develop a transformed mind, so yes we must be willing to read a 400 page work even if we are convinced that we won't agree with the conclusions. He was correct in that most Christians and Christian educators aren't willing to do that....BUT these are the ones that we are looking to for well informed answers. Lord help us!! I will defer on the annihilationism controversy, but I do want to address the last question regarding children who die and people who are mentally incapable of coming to a saving knowledge of Jesus Christ. My answer to that question is simple, and though I have no doubt I'm not the first, I haven't seen it elsewhere. I'd appreciate any insights. First, I presume that God is omniscient; H. Wayne House describes it as "God knows all actual and possible things." and he references Ps 139:1-4, Ps 147:4-5, and Mt 11:21 (Charts of Christian Theology and Doctrine, pg 41). In Matthew Jesus says that if "x" had happened, people "would have" repented. So God not only knows what the future will be, but He also knows what the future would have been if man's sin nature and free will had not intervened. So God knows what that little boy would have been if he hadn't been aborted, or if mom hadn't used drugs. God's knowledge is limitless, and knows all of the possible combinations that could ever possibly happen. God also knows the heart of each person, no matter what their age or mental capacity, because God knows what that person would have been had sin not destroyed their life or mental abilities. So to me the answer is simple; I don't know and really can't know, but God does. Are heaven and hell real destinations? Yes, but only God knows the heart. Although I am certain that a few of the people I've met in my life have been truly evil, I must submit that God knows them better than I do, and focus instead on being obedient to God's plan for my own life. From age 15 to 25 I was a committed Atheist with a sincere belief that science had made belief in any and all concepts of "god(s)" archaic and unnecessary. I was a successful, drinking cussing atheist, in the Truck Tire Business. One day one of my employees shared with me that "the way you use my best friends name really bothers me." He then explained that his best friends name was Jesus Christ. I decided to read the Bible so I could dismiss it as a book of myths and fairytales. Instead I came face to face with Jesus Christ. Within 6 months I was a student at BIOLA and went on to receive my MDiv from Talbot in 1972. I have served as the Pastor of four churches. I think Rob Bell has advanced the discussion as to the fate of all those who have lived before Christ and/or without any knowledge of Christ. Professor Naidu speaks of the grace of God which brought the Gospel to his Hindu Great Grandparents "several generations ago". He does not tell us what he believes about his ancestors who lived and died BEFORE the missionaries arrived. This is the issue Mr. Bell tries to address this book. I share his concerns about the mostly unintended portrayal of God as some kind of capricious "Cosmic Bully" who chooses a few lucky souls to reveal Himself to in some very limited times and ways and sends the rest off to the eternal flames and torment of Hell. I do see the danger of misleading people into thinking they can postpone making their personal decision to accept Christ as Savior and Lord but I also see in this book a worthy attempt to deal with the questions about those who have NOT had the opportunity to accept or reject Christ during their life here on earth. The issue is not about a "second chance" for those who have heard but a "first chance for those who did not hear or only heard a distorted message during their earthly life. In Romans Chapters 1 and 2, we are told that everyone can see the evidence of God's existence in the wonders of His Creation and that GOD will judge every person based upon their response to what they know: Romans 2:15-16: "...their consciences also bearing witness, and their thoughts now accusing, now even defending them...when God will judge men's secrets through Jesus Christ." In any Judgement the key elements are: "what did you know, when did you know it and what did you do about it? When I met Jesus Christ on the pages of the BIBLE on July 18, 1963, I was not "scared out of Hell", I was brought into God's Eternal LOVE! In just a few hours God showed me by His Holy Spirit that I was a sinner and that Jesus had Died for me and had Risen from the Grave with forgiveness and LOVE. There was a moment in time where I had to make a decision and I decided to leave my old life and business and to Follow Jesus. The question is "Why Me and not all those other people in all those other times and places? 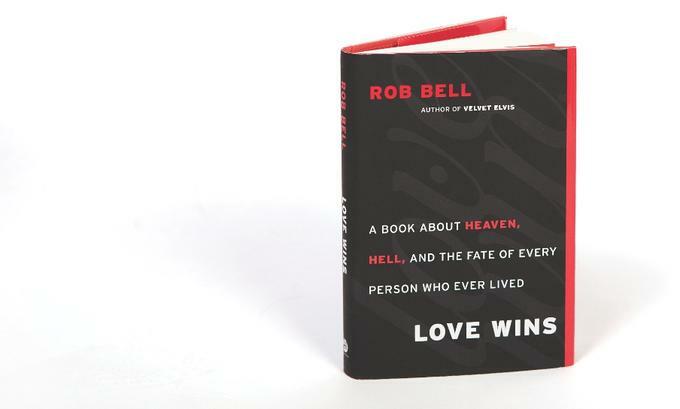 In this I agree with Mr. Bell: God is Love and Love Wins! Let us reach out to all with HIS LOVE! "From what I’ve seen and what I’ve read, the problem seems to be more existential, more emotional than scriptural and textual." This is so disappointing to see. Please hear this as intended with respect, but if a person who is a professor in theology can say that this is the basis for annihilationism, given what he has seen and read, then I submit that he should have said "as your question is about annihilationism, please allow me to refer it to someone who has read a bit more on the subject." I have lost count of the times I have seen the weel poisoned this way - and by evangelicals. Please reconsider speaking this way about a point of view that many of your brothers and sisters have invested great patience and effort defending as a throroughly biblical perspective. To be so dismissive is surely out of place. The doctrine of annihilationism is believed by a large and growing number of evangelicals because 1) They have seen that the typical defences given for the claim that the doctrine of eternal torment are surprisingly weak, and 2) the evidence that the Bible teaches annihilationism is much, much stronger than professors who make comments like those in this article would have had them believe, and their view was turned upside down when they discovered the evidence for themselves. Incidentally, professor Naidu, if at some point you might be willing to discuss this on a show dedicated to respecful dialogue exploring people's views on final punishment (and yes, the show is run by annihilationists), feel free to drop me a line. I have found that the need for the doctrine of annihilaton is resolved in Gerry Beauchemin's book "Hope Beyond Hell " The PDF version is available as a no-cost down load: www.hopebeyondhell.net. Were you consistent? Unless you can answer A to #1-3, you are inconsistent to answer A to #4-6 because these sentences with word “eternal” are exactly the same. So, if B to #1-3, then you should at least consider B for #4-6. If not, why not? The point of 6 questions is to show that our view comes from outside ideas/texts. Now, note that the DURATION can be exactly the same: all imparted ONCE (redeemed/destroyed once) but all permanent, irreversible, for the rest of eternity, hence ETERNAL. Can this be the plain consistent meaning of eternal for entire scriptures including Mt 25:46 and especially ``eternal life``. I`d say Yes! Although we have a measure of life now, many Scripture says life is fully GIVEN ONCE at the applicable resurrection/judgment... when mortality is swallowed up, when we will be MADE ALIVE (finally/fully) at His coming (1Cor 15:22-23), when we receive (once) in the AGE TO COME, ETERNAL LIFE (Luke 18:30). 1. The concept of an underworld abode for the dead was not original to Christianity, as it was conceived of and written about long before the composition of both the Old and New Testaments. Ancient Near Eastern (early Mesopotamian) ideas about death and the underworld preceded those found in the Bible. 2. The New Testament (early Christian) scriptures borrow ALL their terms for hell from other preceding ancient sources: Hades and Tartarus (names for gods AND locations/ places in ancient Greek mythology) and Gehenna (Enoch and the Apocalypse of Peter from the Intertestamental and Rabbinic literature). Many people learn about these derivations in a strong college program or seminary, but it is not common knowledge in the pews and pulpits of many traditional Evangelical and Fundamentalist churches. 3. Frankly, select Evangelical and even Fundamentalist authors will reluctantly admit–when off the public stage– that the symbols associated with hell (eternal flames in eternal darkness,undying worm, gnashing of teeth, lake of fire, bottomless pit, etc.) are symbols that were not meant to be taken literally. Such images represent notions like “separation from God” or “spiritual death,” and John Calvin along with other classic Christian authors acknowledged the metaphorical/ symbolic reading of passages about hell long before Liberal theology did so. Contrary to popular belief in American churches today, it is NOT the liberals who first critically examined hell. 4. From a practical theological standpoint, one could argue that most Christians living today do not really believe in hell as a literal place of eternal torment. If they did, their missionary efforts and daily behaviors would be much more serious and intense. Their behaviors would align with these "beliefs." 5. Even if one does take hell “literally,” there are still many questions rooted in a contemporary understanding of both physics and cosmology about the plausible location and extent of this eternal abode of torment. Many supposedly “biblical” messages about hell in pulpits today try to incorporate extrabiblical themes, images and ideas that are clearly absent from the biblical depiction of hell. For example, notions about different levels of hell, demonic torments and the occupants of hell really owe more to authors like Virgil, Dante, Milton or even movies, graphic novels and local Halloween “hell-houses” than to actual passages from the Bible. 7. Recent reinterpretations of hell as somewhere “out there in space” or “deep inside the human heart” run counter to the original, ancient depictions of hell or the underworld being localized somewhere in the bowels of the earth. 6. Recent reinterpretations of hell as somewhere “out there in space” or “deep inside the human heart” run counter to the original, ancient depictions of hell or the underworld being localized somewhere in the bowels of the earth. In light of my previous post, a key question still remains: What is the ontological status of what is represented by words like sheol, hades, gehenna and tartarus? Or what is the reality behind the images, the masks, the ciphers? A quick answer: From the vantage point of the Gospel, it is a SERIOUS personal decision that is tied to these ancient images. Jesus evoked the seriousness of hell throughout His earthly ministry. As rabbi, teacher, prophet and revealed Son of God, He confronted his hearers with a serious choice tied to the many images about being lost. Hell's eternal mysteries do not invalidate its alliance with the most serious choice facing all human beings: eternal life with God through Jesus Christ or separation from all that is beautiful, good and pure in this world and beyond. A much better book on the ancient pagan roots of the underworld and the Christian understanding of hell is Alan E. Bernstein's The Formation of Hell: Death and Retribution in the Ancient and Early Christian Worlds (Ithaca, NY: Cornell University Press, 1993). Far more informative than Rob Bell's random, postmodern musings. perhaps He chose these 'future believers' for a specific purpose. opportunity to "confess with their mouth Jesus as Savior." This is the psychology of groups who may say that "you may be saved today, but you can lose God's grace at any time, and if you die during a fall from your faith, eternal hell and suffering await you." In this view, a believer can never know if he is secure in his salvation. Of all the underlying Christian psychologies about salvation and hell, this one might be the most severe. In this scenario (represented primarily by Roman Catholicism), a person who "falls from grace" and dies could end up in a limbo state (Purgatory) where impurities are burnt away and entrance into heaven is still possible. In this option, the road to hell has exit ramps aided by prayers of the saints. But forget Purgatory if you committed mortal sins while living. Here, the redeemed go to heaven, but those who were lost end up annihilated for eternity. The lost who will not regain consciousness again. It is presumed here that eternal consciousness in heaven is preferable to eternal non-being. Those advocating this idea often quote Christ's words "broad is the way that leads to destruction" (Mt. 7:13-14) in support of the "doctrine" that a majority of people are predestined by God to be tormented in eternal hell even before they are born. A tiny, "righteous remnant" can be be assured of their eternal salvation. On this account, hell or perdition is reserved for the worst of the worst (i.e. the Devil, his minions of fallen angels, the Antichrist, false prophet....maybe Judas and a few other notables). Some versions of this narrative support a version of purgation after death for those who are still redeemable, but the focus here is on the "a great multitude no man could number" seen in heaven by John the Revelator (Rev. 7:9). The third century theologian Origin sketched a version of this option. In it, even the possibility for the redemption of the devil and the fallen angels is possible. Those supporting this view argue that many Biblical words for hell represent ancient ideas borrowed (or stolen) from other cultures. Or, they emphasize that metaphors about heaven and hell represent realities that we still do not understand (altered states of consciousness, political structures,social arrangements, etc.). Proponents of this option secretly agree with aspects of #7, but once outside of educated/ skeptical sectors, they preach literal hell fire in their pulpits and popular works for pragmatic reasons. The Inner Pharisee inside each of one us tends to forget that JESUS is the Living Word, not some old dogmatic doctrine that is difficult to verify. Jesus's work on the Cross and His Resurrection was and IS truly Sufficient to satisfy God's justice. When Jesus declared, "It is Finished," that's exactly what He meant. Sin, death and the devil....and even Hell....were defeated....then, now, and forever. Enjoy the fruits of His finished work....believe....and receive...."It is Finished"
If we are believers in Christ, Christians, then Christ's words should be the foundation of our interpretation of hell. No matter how clever one's spin is when defining the phrase "eternal punishment" you cannot get away from it's simple meaning. And if God would be unjust to allow someone to suffer for eternity for a few years of sin, then it begs to ask if He would be unjust for allowing someone--who has only lived for a 1000 years--to burn in hell for 6000 years. If the first is unjust, then the latter is also. Now according to the Apostle Peter, Jesus preached to the damned souls in who drowned in Noah's flood. During their era, they lived out their lives for about 1000 years, yet these were still suffering in hell thousands of years later during Jesus' death. If God is just and righteous, how could he torment unfairly, in any degree of unfairness? And how can He punish the unrighteous in hell while being unrighteous Himself? And if annihilation is a show of God's loving nature, why wasn't His loving nature active before Christ's death? Does His standards change from era to era? No. It is NOT unjust for God to torment the wicked. And just because we don't know the laws of heaven doesn't mean we can adjust them to our liking, to fit our fancy, and make us feel more at ease. "These shall go away into everlasting punishment" (Matthew 25:46) means their punishment will last forever. What is the punishment? Jesus always warned that our judgment was of being thrown into the fire, and never of turning into ash and disappearing. How easily are we persuaded to shift this idea. For if the fires of hell consumes, then why don't the worms die too? Jesus said the "worm dies not" within this "consuming" fire. If the fire burns up one, then it should the other also. “WOW,” I was taught and believed that multitudes upon multitudes of humans will suffer “eternal torment” for 100 trillion years, and then another 100 trillion years, and then another 100 trillion years, and it goes on and on with no hope of it ever ending. I am certain that each one of us, deep inside of our very being, know that something just does not add up, but we just can't quite figure out what is it that we are not understanding correctly from the Scriptures. My name is Alan Finch. I became a Christian 42 years ago. I am adding another comment to my previous comment in July of 2018.